What is the Bovine Artificial Insemination Cattle Kit? All Veterinary Supply provides more than flea & tick products and pet-friendly shampoos. We offer serious tools for farmers, veterinarians and breeders. Use our bovine artificial insemination kit to effectively control your cattle’s breeding patterns. This tool is useful if your cattle’s mating has yet to result in pregnancy, or if you are simply looking for a way to control the number of calves born. Who is the Artificial Insemination Cattle Kit for? How is the Artificial Insemination Cattle Kit used? 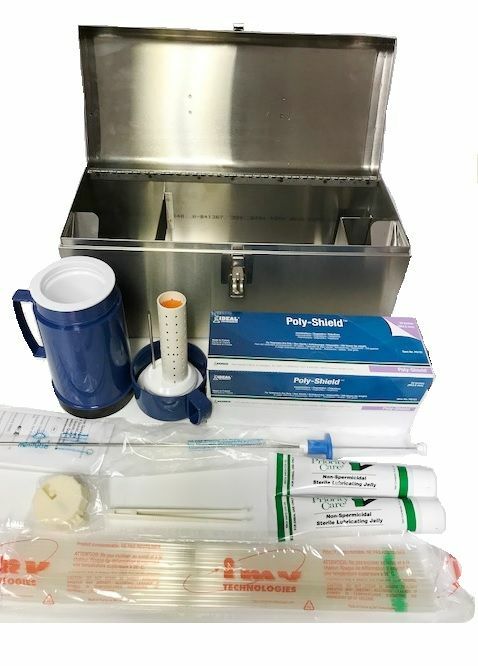 Inside this kit you will find everything you need to safely and comfortably artificially inseminate your cows. 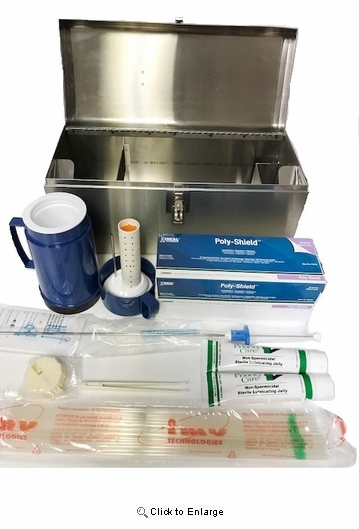 Our bovine insemination kit can be used an unlimited number of times. - (1) Durable 24 gauge polished stainless steel case, heavyweight sturdy latch, dimensions - 18 1/2" long, 8" wide, 8 3/4" deep. - (1) Quicklock Insemination Gun (Minitube).